“From So Simple A Beginning: Celebrating the Evolution and Diversity of Birds"
Download a large-size version of this image by filling out the form at right. We'll send you an email with more information about the mural crowdfunding campaign as soon as it's live. You can unsubscribe at any time. The Cornell Lab of Ornithology has commissioned fine artist Jane Kim and her studio Ink Dwell to depict the diversity of birds through a mural in the visitor center of the Johnson Center for Birds and Biodiversity. Jane will paint the history of birds spanning 375 million years, featuring one representative bird from every bird family in the world, including several extinct species. In August 2014, we will begin the first phase of raising funds to support the completion of the mural. We're offering you an exclusive image of one of the birds that Jane will paint on the wall. 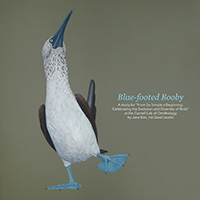 Submit the form above today to receive this Blue-footed Booby study as a large-size digital image. It'll look great as your computer wallpaper!